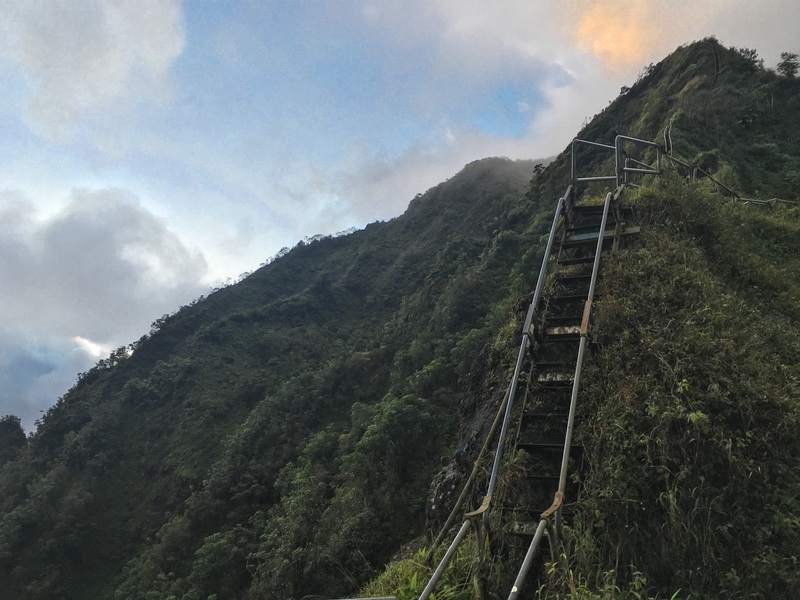 The Stairway to Heaven (Haiku Stairs) consist of 3,922 stairs along the Ko’olau Mountain Range. The stairs were once a wooden ladder (1942) used by the United States Navy, later replaced by metal stairs by the United States Coast Guard for military purposes. The trail was closed to the public in 1987. 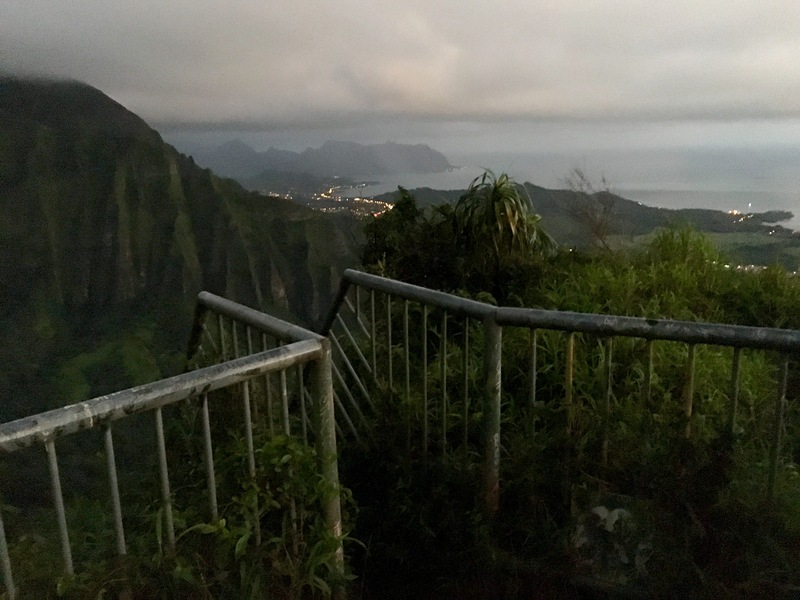 In 2003, the stairs were repaired, costing tax payers a lot of money, but land usage rights with the community have not been resolved, so the Haiku Stairs continue to be closed to the public; such a shame. Discussion Regarding the Legality of the Haiku Stairs. I was told by a local that the Haiku Stairs were damaged and that 5 million dollars of the tax payer’s money went to repairing the stairs to reopen them to the public. 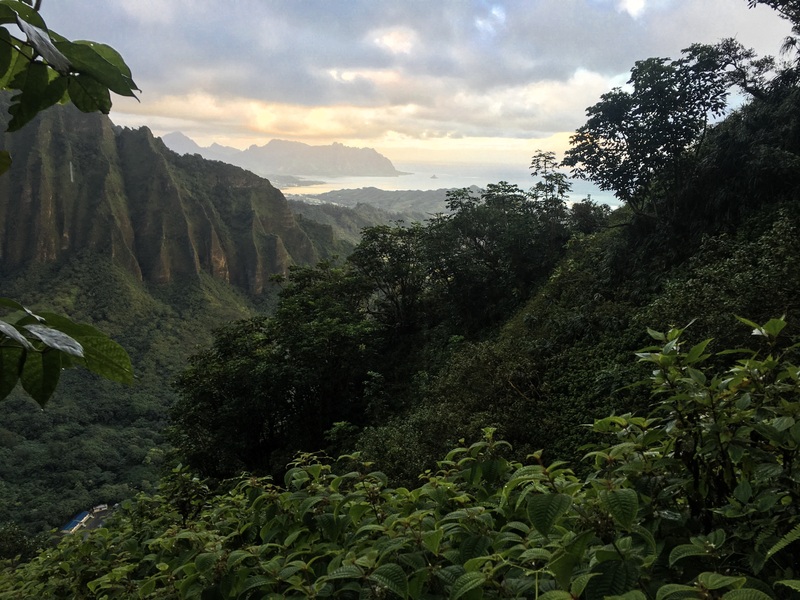 However, since the trailhead to the Haiku Stairs is located in a neighborhood, the members of this community fought to keep the stairs closed, which I think is an injustice. 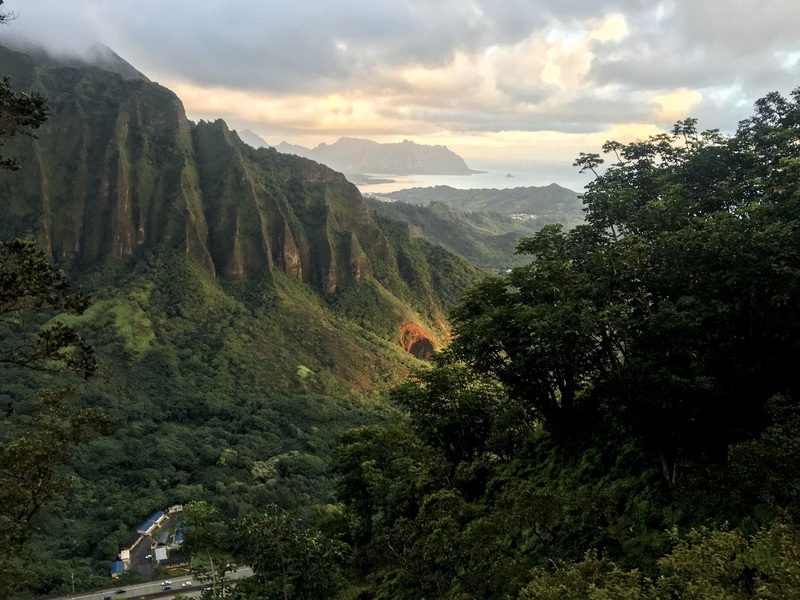 The Haiku Stairs Hike is one of the most sought after hikes on social media sights, such as Instagram. Despite the stairs being closed, several adventure seekers climb the stairs on a daily basis. I am not condoning my behavior, nor others who climb the stairs. However, as far as I read, the stairs are only closed because of the community members. 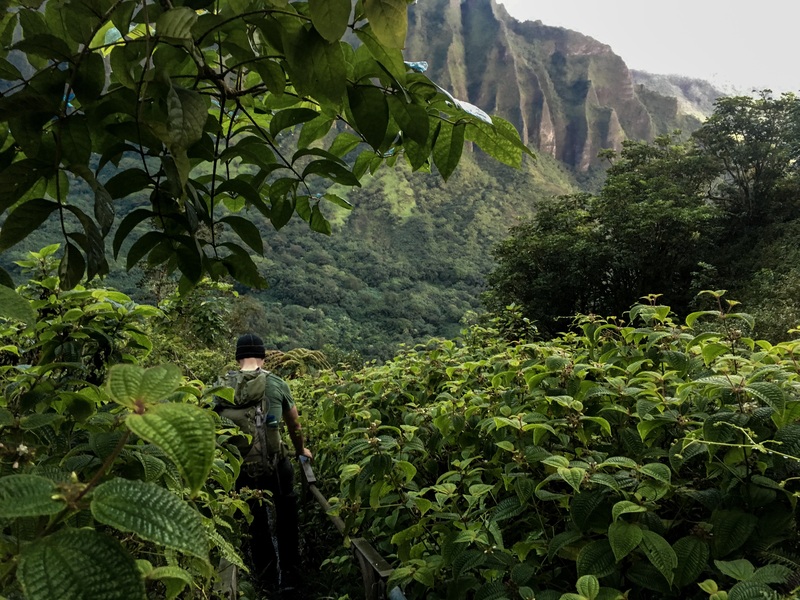 If they reopened the stairs, they could make a path to the stairs that does not go through private property and even make hours for climbing during business hours, so hikers do not disturb the locals. I believe that the stairs being closed, makes them more desirable to attempt. Why not share the beautiful views and the challenge of the hike, with everyone, as you once did? In respect for the community members, I will not share with you how we got to the Haiku Stairs. 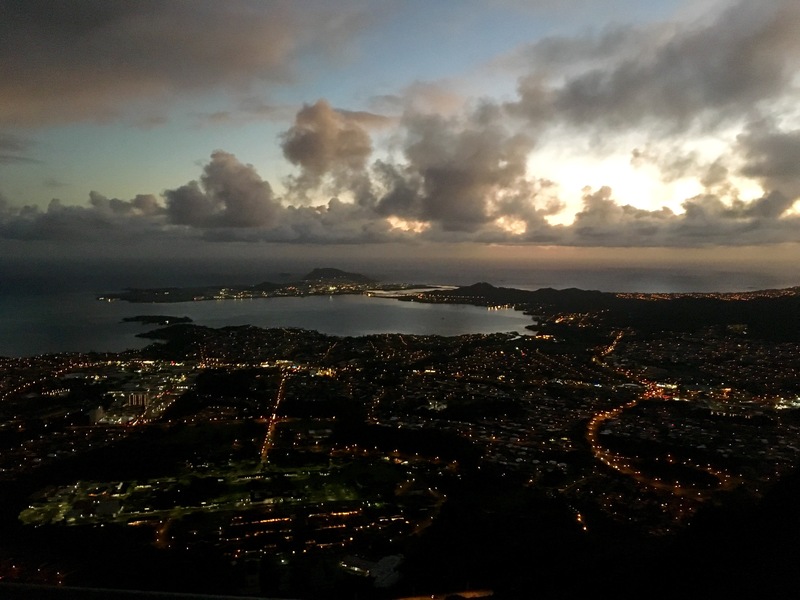 (I am not even sure how we eventually got there and there are plenty of websites that offer directions to the Haiku Stairs). I will tell you that there are community members who guard the gate, who will shine a flashlight in your eyes (talk about disrespectful) and take pictures of you, claiming they are sending the pictures to the guard and the authorities. We respectfully continued on our journey, past the guard and no legal action was taken against us. I cannot promise that you will have the same luck that we did, in your attempt. Be respectful of the community members, but don’t let them scare you away. The actual Haiku Stairs are not on their property. Going up the Stairway to Heaven. Going up the stairs wasn’t that bad. The sun was not up yet, so I wasn’t able to see how far up we were. There were still parts of the stairs that were damaged, requiring some yoga moves and balancing to climb over. The railings were wet and slippery. Some of the stairs were missing, while others were damaged. For the most part, the stairs were intact though. After climbing about 3,000 out of the 3900 stairs, we reached a platform with an amazing view. At this point, the sun was starting to peak around the corner of the mountain and I could officially see how far up we had come. The last leg of the stairs that stood before us, were steep and along a narrow mountain ridge. My fear of heights was festering inside of me. After taking in the amazing view, I took about 10 more steps up the mountain ridge and fear took over. I climbed back down those 10 steps, and unfortunately threw in the white flag. Although others who were also climbing the stairs said that they couldn’t see anything after the platform we were on because of the clouds, I still am disappointed in myself for not completing the stairs. Someone wise once said, “don’t ever climb or hike up anything you aren’t willing to go back down”. I knew that if I finished the stairs, that it would be an even bigger challenge to go back down, if I would even be able to. I highly recommend going down the stairs backwards. This allows you to maintain better balance and have a better grip on the railing. This is also good for those of you who are scared of heights, like myself, because you are not able to see how far you could fall (as many people will say, don’t look down!). I did, however, stop on several of the more level areas to take pictures and enjoy the view. Going down wasn’t as difficult as I thought it would be, but definitely sucked on the really steep parts of the stairs. Although I only climbed about 2/3rds of the stairs, it still felt like an accomplishment and I know that even if I were to go back another time, my fear would still restrict me from finishing the stairs. I highly hiking the Haiku Stairs for all you adventure seekers. Please be respectful of the land, the community members, and others on the stairs. Be safe, and know your limits! Remember, don’t climb anything that you are not willing to go back down! Aloha!